At the end of March 2012, the Israeli diamond industry held a farewell ceremony honoring Nicky Oppenheimer, the former chairman of mining giant De Beers, who decided to terminate the Oppenheimer family’s ownership of the company and transfer it to the Anglo-American mining conglomerate. The Israeli diamond industry honored Oppenheimer with its Lifetime Achievement Award for his contribution to the global diamond industry in general and to the Israeli diamond industry in particular. In May 2012, Israel hosted the CIBJO Conference for the first time. CIBJO is an international trade association that brings together jewelry trade organizations from around the world and seeks to promote collaborations in the jewelry industry, as well as industry trade solutions. Some 200 people from 40 countries attended the Israeli conference. 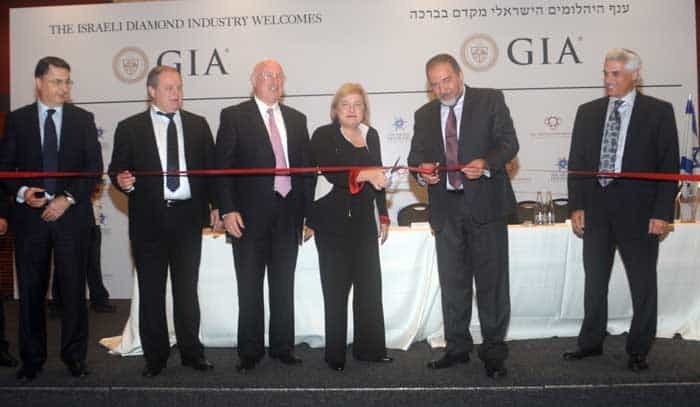 In September 2012, the Gemological Institute of America dedicated its first branch in Israel. Then-Deputy Prime Minister and Foreign Minister Avigdor Lieberman and GIA President Donna Baker attended the ceremony. In March 2013, the Israeli Diamond Exchange hosted International Diamond Week for the first time. The Diamond Exchange’s main trading hall was turned into an exhibition hall where Israeli diamantaires showcased their merchandise alongside American diamantaires. The exhibition was open to buyers from abroad. In March 2014, some 300 diamond dealers from Israel and abroad took part in Israeli Rough Week events, hosted at the Diamond Exchange’s rough diamonds hall. Four companies selling rough diamonds, hosted booths in the rough hall and conducted sales and tenders for rough diamonds. In 2014, the MMC – Modern Manufacturing Center was inaugurated. The center houses 76 polishing stations, a diamond polishing school and advanced technological equipment, and offers a professional and secure work environment. The center held its first diamond polishing course in November 2014. On the 14-16 of June 2015, Israel hosted the joint session of the World Federation of Diamond Bourses (WFDB) and the International Diamond Manufacturers Association (IDMA). The biennial conference is traditionally held in a different country every time. More than 30 diamond exchange presidents and 16 IDMA members attended the conference, alongside many industry executives from various countries. In mid-2016 the IDI Group of Companies launched an innovative diamond trading platform – www.get-diamonds.com – bringing together the inventories of Israeli diamantaires with aim of promoting overseas marketing. In November 2016, the Harry Oppenheimer Diamond Museum launched its new website as well as a Facebook page. In early 2017 the new ITC – International Tender Center, built according to the international standards of other tender centers around the world, was dedicated. The center provides diamantaires seeking to purchase rough diamonds with all the necessary services. Also, a new laser-cutting room was opened in the Diamond exchange, including the Synova’s laser micro-solutions machining, as part of the IDE’s efforts to adopt cutting-edge technology so as to benefit the Israeli diamond industry. On April 10, 2017, the Israel Diamond Exchange’s Code of Ethics was signed, placing it at the forefront of the global effort to cement proper administration and transparency in the diamond industry. The Israeli Diamond Exchange’s Code of Ethics was written by Professor Asa Kasher in collaboration with the appropriate IDE committees. On November 15, 2017, the Israeli Diamond Exchange marked its 80th anniversary at a festive event at the Charles Bronfman Auditorium in Tel Aviv. The past decade has been characterized by vigorous activity on the part of Israeli Diamond Exchange with aim of promoting diamond marketing. As the IDE celebrates its 80th anniversary, it proudly promotes technological developments.